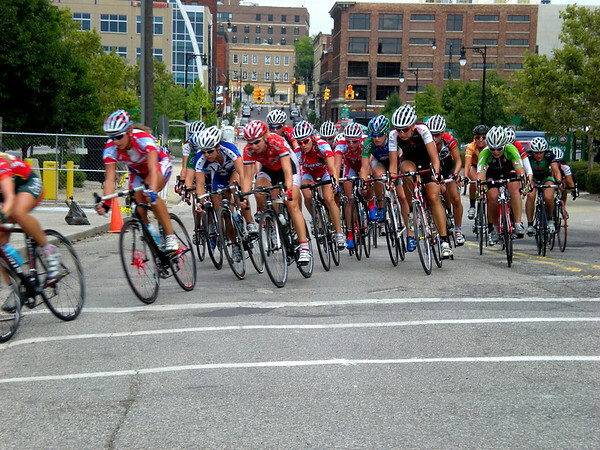 I want to ride my bicycle, I want to ride it where I like..."
Yesterday Dane participated in his very first bicycle "race" in Grand Rapids. 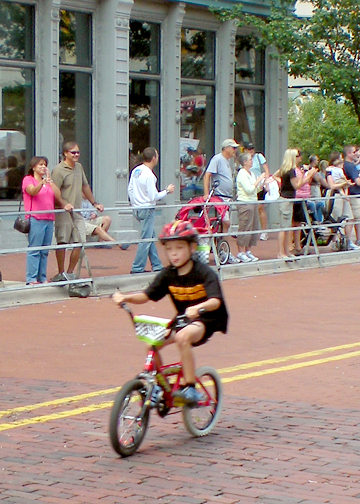 As part of the Priority Health Cycling Classic they offered a kids' race. Dane pedaled his little legs off for just shy of a mile (a full loop of the course). Note how Dane is a blur in the photo at right...and his "concentration tongue" (whenever he is putting a lot of effort into something he tends to stick his tongue out. Kind of funny that he was doing this towards the finish of his race, too). It was really amazing to see the variety of bikes kids rode...everything from el-cheapo budget bikes like the one Dane has nearly worn-out over the last few years (and outgrown) to high end Specialized and Trek/Gary Fisher models. I even saw a few kids with clipless pedals--definitely tikes who have become serious about the sport from a pretty young age. After the kids' race we semi-watched the women's Cat 1 race and then about an hour of the Cat 1 men's race. Man, they are FAST! They create a serious blast of air as they fly by. Derek got some neat little video segments with our point-n-shoot camera that I will post once he has them uploaded to YouTube. We eventually found a Subway and had a quickie supper before heading to the Wealthy Theatre for "Jake's Music Fest," Jake has type 1 diabetes and this was the 4th year that his family has put on this event to help raise money for their JDRF cycling trek. At the concert festival I had the great pleasure of meeting Andy Holtgreive, lead singer of Domestic Problems. I have been a DP fan for probably close to 15 years, ever since I first heard their "Scattered Pieces" album. The last time we were able to see the entire band perform live was while I was 5 months preggers with Dane. I can clearly remember him "dancing" around in my belly for pretty much the entire performance, which I took as a certain sign that he was enjoying himself. Nowadays DP is pretty far-flung across the US, but they still reunite for performances from time-to-time, so I really hope we can manage to catch the entire band at some point in the coming year. I think Dane would really get a charge out of seeing them perform, too, though last night it was pretty beyond his bedtime by the time we left the theatre...and his meds had worn off hours prior. So by the time Andy played he was becoming increasingly belligerent, disruptive, and wild. Overtired kids with ADHD are a pretty lethal combo. Andy played about 4 songs between larger acts last night, but included my request for "Untitled," which had me pretty tickled. That song still does not fail to give me chills, especially when hearing a live performance. Andy also talked about his kids and his personal connection with juvenile diabetes via his best friend's child. It really added an extra level of emotion to his singing. In addition to getting to see Andy sing the other highlight of the evening was the group The 5-Leaf Clovers. The Band is comprised of a dad and his 4 pre-adolescent kids. Amazing talent. The eldest son played guitar, second son played fiddle, youngest son played drum, daughter sang and Irish step danced, and the dad played banjo. Awesome talent and traditional Irish folk music.